Drama is a ministry that can involve many people in a church congregation. This book discusses stagecraft, dramaturgy, and how to use drama in the church, using as its foundation, the command of Christ to love God with all our hearts, bodies, souls, and minds, and our neighbors as ourselves. One of the most devastating ploys of Satan is to steal a Christian’s joy. This humorous play has four demons giving an annual report of their year’s activities to a head demon. The most successful minion is the one who convinces a church congregation their salvation is by works. All five roles can be played by men or women. I took the monodrama, “A Leper’s Song” (described below), and expanded it into a three-person one act play. The young maid tells her story of Naaman’s healing to another little girl who has recently been captured and brought into the household. The third character is Naaman’s wife. One of the funniest conversations not recorded in the Bible had to be the one between Naaman and his servants when they persuaded him to bathe in the Jordan River. Lots of fun. Roles are for three men and two women. A play that takes place in Nero’s Rome, it features the Centurion who was present at the cross and a Christian woman, Julia. Persecution against the believers has become intense and Julia has been arrested. Highlighting the Lord’s Prayer and Psalm 145, we see how the courage of the faithful witnesses to the skeptical. One man and one woman. Have you ever wondered why a small child gets scolded for spilling his milk and then when an adult does something similar it is laughed off? 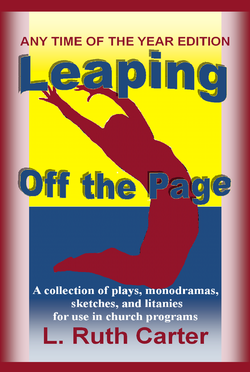 This humorous play asks that question in the context of a discussion about grace. Two women, one boy and one girl. This short two-person play is a humorous look at the Fruit of the Spirit. A very short piece on the relevance of mission work. A two minute piece about attending church even though golf beckons. I must be honest: including this two-person sketch is a little self-indulgent. I wrote it about Charles M. Tanner, the founder of Covenant Players, after his death in 2006. Only people who knew him will get some of the in-jokes, but I'm hoping other people will get some fun out of it as well. A short play on missions and how living your faith can show in your life. In a replaying of the Unforgiving Debtor Parable, an athlete gets into hot water with his coach. This is a light hearted treatment of the sister relationship. Can sisters also be friends? Delightful if performed by two children. The play is about five minutes long. I wrote this for some children's ministry. It has an object lesson followed by the story of the Garden of Eden as told by Eve. Saul is on his way to Damascus and the followers of Jesus fear for their lives. A brand new believer, still unsure of herself, struggles with her fear and her faith. She works through the Lord’s Prayer and Psalm 145 to a point of peace and victory in the Lord. This monodrama is similar to “Thine is the Kingdom” listed previously. This monodrama deals with a family ripped apart by death and the healing that comes through mourning. 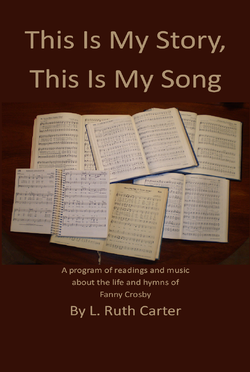 It features the writer of the hymn, “It is Well With My Soul”. The great missionary hymn, “So Send I You”, was written by Margaret Clarkson when she was a young, discouraged school teacher in Northern Ontario. This monodrama captures the feelings of her famous poem and culminates with a recitation of it. Please note, the play quotes the full poem, which can be acquired online. The characters in the Bible fascinate me. I've written several monodramas about them. But what about those people who merit only passing mention? Who were they? What are their stories? I've long wondered about Euodia and Syntyche, the women Paul asked to try and get along with each other better in his letter to the Philippians. How, I wondered, did they feel when the letter was read in church? This monodrama is my idea of how Syntyche responded. I love the Zacchaeus story. Makes me think of Ebenezer Scrooge. The thing that moves me the most is how Zacchaeus responded to grace. This humorous monodrama, I hope, captures that. A litany for Palm Sunday, it includes a responsive reading interspersed with singing. Previously published by Lillenas Publishing Company in their Easter Program Builder No. 32. Monodrama. One woman. Six to eight minutes. Featuring Salome, the mother of James and John, this piece takes place in that time between Jesus' death and His resurrection. As she grieves, she ponders some of the things Jesus said to her. Worship Services for Good Friday and Easter Sunday. This is a “two act” program, Act One:The Passion, and Act Two: The Resurrection, which revolves around the questions asked by the traditional spiritual, “Were You There When They Crucified My Lord?” These questions are answered in monologs by biblical characters who were there. Poems, litanies, music, and audience participation put everyone in the congregation there, and affirm the resounding truth that God was there. This script is available as a single printable document, and is listed on the "Store" page. Previously published by Lillenas Publishing Company in their Easter Program Builder No.31. Comedic Sketch. Four children. About six minutes. Two children explain Palm Sunday to a couple of friends who have a hard time understanding what it all means. Mary Magdalene has just seen Jesus alive, and she is overcome with joy. Previously published under the title "In Him Is Light" by Standard Publishing Company's Easter Programs for the Church, 2004. Short Play. Approximately eight minutes. Two women discuss what they're getting their mothers for Mothers' Day and gain a new appreciation for their moms. A young pastor, whose wife is expecting their first baby, wonders if he can be a good dad. The church secretary asks him what kind of dad his father was, and how he can follow his father's example. Previously published by Lillenas Publishing Company in their Mother's & Father's Day Program Builder No.12. Alphabet Poem. Eight children. Two minutes. Spelling out "Hosanna!" children tell the story of the triumphant entry using rhyming couplets. Previously published by Lillenas Publishing Company in their Easter Program Builder No.34. Previously published by Lillenas Publishing Company in their Easter Program Builder No.33. A Christmas Eve worship service. Using the five stanzas of "Angels from the Realms of Glory" to represent each of the five candles in the Advent wreath, we have a lovely time of worship with singing and scripture readings. The time of the program will be affected by how much music you use. Short Story. Six to eight minutes. What inspired somebody to write a poem that was to become a favourite Christmas carol? The poem, "Christmas Bells", a testimony to the faith of Henry W. Longfellow, is better known by its first line: "I heard the bells on Christmas day..." This story tells of the journey Longfellow took through the devastation of the American Civil War and heart-breaking personal tragedy to a deeper faith in a God who is not dead "nor doth he sleep." Previously published by Lillenas Publishing Company (www.lillenas.com) in their Christmas Program No. 64. Short Story. Five to seven minutes.. It's a well-known story: during World War I, several spontaneous celebrations of Christmas randomly occurred in the trenches as enemies put down their weapons and met in no-man's land. In this story, we see the events unfold through the eyes of Franz, a young German soldier. Previously published by Lillenas Publishing Company (www.lillenas.com) in their Christmas Program No. 62. One-Act Play. Approximately 20 minutes. Three women. What do you do at Christmas time when it seems like God has forgotten you and that you have no significance, no "moment"? Marilyn, a photographer, works with her husband at the local mall. He is Santa Claus, and she takes pictures of him and the children. Because her husband is battling cancer, Marilyn is facing a crisis of faith. Does God care, she wonders? Anna is the owner/operator of a small café. Sally, who works at the café, is Anna's granddaughter. Anna and Sally also have tragedy in their lives that has battered their faith, but they're fighting through it. "A Christmas Moment" is what happens when Marilyn walks into the café, and doubt and despair meet faith and hope. This is a one-act treatment of the monodrama, "Megan's Moment." Previously published by Lillenas Publishing Company (www.lillenas.com) in their Christmas Program No. 63.
for ChildrenNine simple pieces which vary in length from a couple of lines to a poem of four stanzas. A Rap. Three to four minutes. Three people plus. A raucous, rhyming piece of fun plaintively asks the question, "where is Jesus?" in the midst of Christmas chaos. Monodrama. Eight to 10 minutes. One woman. Tired, sad, and discouraged, photographer Marilyn has returned home after working all day at the mall taking pictures of children sitting on Santa's knee. Her husband Charles, who plays Santa Claus, did not come home with her because he is helping Megan, one of the children who saw him that day. Charles has cancer. Megan's mother has cancer. 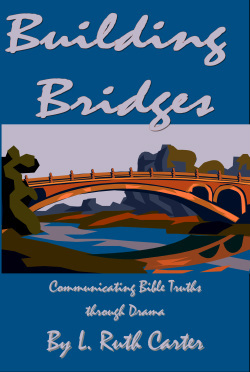 Marilyn is trying desperately to grab hold of the faith Charles has in rich abundance as she struggles with her doubts. How can God care, she rages? We watch as she is lifted from despair into hope, from doubt into faith. This is a monodrama treatment of the one-act play, "A Christmas Moment."